Ergonomic office solutions that create a better work environment. Increase productivity with the correct desk system. 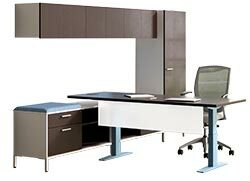 Sit/stand, cubicle design, executive desks, our design experts will help. Sit/stands have become a great way to achieve movement while maintaining productivity. Solutions that integrate into existing workplace aesthetics is a specialty of ours. Aesthetically matching office ergonomic chairs, executive chairs, specialty chairs, conference room and guest seating is the next step in the pursuit of health and we make that a reality. Easy to install and configure! Not just for open office environments, but offers gorgeous private office configurations too. Business Furniture and Ergonomics, how to balance ego and ergo. A properly fitting task chair is essential for today’s office environment. For proper fit, the back support should be able to be adjusted to support the lordotic curve of the lumbar spine and have a seat pan that can provide support just shy of touching the lower leg when sitting back in the chair.